The entire SpeechMED™ platform was designed around the needs of the patient. Once a person creates an account they are able to login to their Patient Portal and add their medical details to our HIPPA compliant secure servers. This information will then be able to be retrieved on a mobile Android phone or tablet, and relay any pertinent medical information to them, audibly and visually, in a language they understand. SpeechMED™ for Families offers friends and family the opportunity to download a mobile Android application that allows them access their love ones primary SpeechMED™ account, to review the account, and be updated as new things occur. For this to work, a patient must first sign up for a basic account, after which the app can be downloaded and connected. This application, like the rest of the SpeechMED™ Platform, is multilingual. Professional caregivers, who managing multiple patients, can also use the Caregiver Companion App to keep track of their patients needs and communicate with them in a language they understand. This can help families keep track of how well their loved one is complying with their medication and therapy regiments. 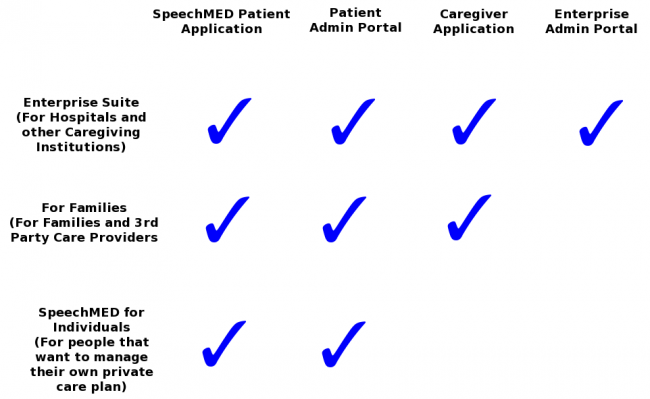 The SpeechMED™ Enterprise Suite allows hospitals and other caregiving institutions to visually and audibly relay vital medical information to their patients, in the language of their choice, so that more patients can understand and comply with their care instructions, and medical mishaps that arise as a result of a poor communication can be easily avoided.